Enchanted by floral gardens, brilliant courtyards, and serene fountains, Quinta Real Oaxaca is a romantic luxury hotel nestled in the historic center of Oaxaca, Mexico. 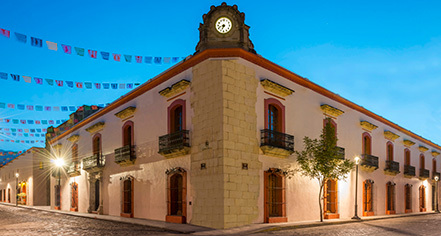 Built in 1576, the hotel was originally the Convent of Santa Catalina de Siena and much of the original structure has been carefully restored and remains displayed to this day, including frescoes and restored tile floors. Affording 91 beautiful suites, this hotel boasts lovely views of the lively city and the natural bountiful landscape of southern Mexico. 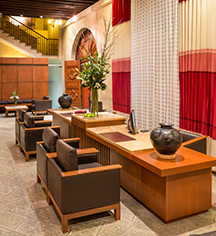 Quinta Real Oaxaca, a member of Historic Hotels Worldwide since 2012, dates back to 1576. Quinta Real Oaxaca was originally the Convent of Santa Catalina until the mid-18th century when the nuns were forced to leave due to political strife. Enchanted by floral gardens, brilliant courtyards, and serene fountains, Quinta Real Oaxaca is a romantic luxury hotel nestled in the historic center of Oaxaca, Mexico. Learn more about the History of Quinta Real Oaxaca .